T-Rot has two cameras which help it recognize both people and objects - like bottles, glasses and refrigerators - and see their position in three dimensions. 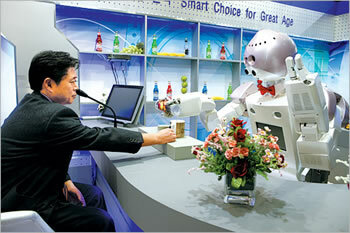 It also has the capability of listening to customers and responding with appropriate conversational comments. In order to correctly apply force to different objects, T-Rot has special skin developed by the Korea Research Institute of Standards and Science. This allows T-Rot to apply the correct pressure in a handshake with a person, or in holding a delicate glass. T-Rot can even pick up eggs without breaking them. See the story Robots Get Pressure-Sensitive Skin for more information. Drinky, drinky, make you stinky," a robot bar said, rolling up and whispering in his ear. It made the sound of ice cubes rattling in a frosty glass. Learn more about T-Rot's predecessors at Koolio the Refrigerator Robot and Pressure-Sensitive Skin; read more about T-Rot the Thinking Robot Bartender.